Dropping winter temperatures can affect your home in a number of ways, including your water system and pipes. If the system or pipes freeze, you and your family will experience an inconvenient and expensive mess. Below are some tips to follow to keep your pipes from freezing. Insulate pipes in unheated areas of your home, such as the attic, basement or crawl spaces. If you live in a moderately cold climate, foam pipe insulation will work. You could also consider Â using heat tape. Protect pipes located in exterior walls of your home with extra insulation. That may mean removing part of the wall to get insulation on the pipes, but you can check for and repair any water damage or mold growth as you complete this project. Turn off outdoor spigots and disconnect hoses. A frozen garden hose can expand pressure in the entire plumbing system of your home. Disconnect and drain the hose, then close off the valve to the outdoor faucet. Allow five drops of water per minute to drip from faucets when temperatures plummet. This action keeps the water moving and can slow the freezing process. Open cabinet doors that cover kitchen and bathroom plumbing. Your home’s warm air can then circulate around exposed pipes and protect them from freezing. Wrap warm towels around slow pipes. The warmth may loosen accumulated ice and assist your water system in operating properly again. To warm the towels, place them over the pipes and pour boiling water on top or make the towels wet first and place them over the pipes. 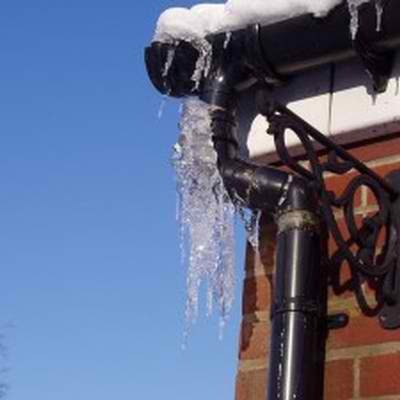 Use a hairdryer or heat gun to blow hot air directly on freezing pipes and melt ice. Remember to avoid using any heating tool with an open flame so you don’t burn your pipes. Shut off the water if your pipes are already frozen. By preventing additional ice from forming, you reduce the risk of flooding your system, and you make cleanup easier. Follow these tips to protect your home’s pipes from freezing this winter. As always, Tracy-Driscoll is here to help you protect your home.Â Give us a call at 860-589-3434, so that our insurance professionals can review, and make sure your home insurance policy is up to date. Your home insurance policy could cover any necessary repairs if your pipes freeze, despite your efforts to keep them running properly.